As the digitally native generation joins the ranks of America’s physicians, their medical educators are looking for ways to use technology in teaching this generation of doctors. To do that, educators need to understand how their residents interact with technology. To enhance that understanding, researchers at Beth Israel Deaconess Medical Center in Boston surveyed 38 radiology residents to assess their usage patterns and opinions of the iPad as a tool for radiology education and clinical practice. The study was published in June in the Journal of the American College of Radiology. Residents were given iPad 2 tablet computers and subscriptions to e-Anatomy, an online radiologic anatomy atlas, and STATdx, an online diagnostic decision-support system for radiologists. Residents were surveyed after six months of use. Thirty-six residents (95%) completed the survey, and 86% reported daily iPad use. Respondents reported significant variation in how they used the devices, though. By a wide margin, the residents used the iPads for educational purposes. Seventy percent preferred them for reading journal articles. Berkowitz says the convenience of reading journal articles on a tablet rather than printing them out or waiting for mailings is a likely reason. Fewer residents used the devices for reading textbooks, with an even 48.5% split between digital and paper readers. The strongest area of response, however, was with e-Anatomy and STATdx. Eighty-eight percent of respondents reported using them daily or weekly, with e-Anatomy being particularly popular. Residents were less likely to use the iPads for strictly clinical purposes, though. 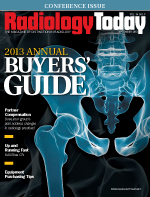 Seventy-five percent reported that they had not used iPads to look at radiology exams; 47% used them during readout; and 12% had used them to edit dictated reports. Berkowitz says one reason for the lower rate of use in these cases may be because tablet devices don’t provide as much utility in these areas. For example, PACS workstations already have three or four large monitors, making a 10-inch screen unnecessary. Berkowitz says anecdotal evidence points to some ways that residents are incorporating tablets in clinical practice, such as to improve the patient consent process for procedures. Some residents will show educational videos or clinical images to patients prior to certain procedures. Although the number of people using tablets in this way is small, patient response suggests that physicians may want to consider adopting these practices. Berkowitz says it’s tough to guess how tablets may be used in the future, but he believes their use will continue to expand. He notes that many content providers have made efforts to develop tablet-friendly formats. As more content becomes compatible with touch screens and less dependent on mouse and keyboard interactions, more users will shift to tablets. Overall, Berkowitz says Beth Israel Deaconess’ experience with iPads has been positive, and he believes the medical center can help to improve iPads’ clinical utility. While the study was ongoing, the only way to view clinical images was through Citrix, a virtual desktop application, which was not convenient for tablet users. A more streamlined user interface may encourage more users to try viewing clinical images on tablets. — David Yeager is a freelance writer and editor based in Royersford, Pennsylvania. He primarily covers imaging informatics topics for Radiology Today.